While driving through the city or along country roads, I frequently noticed plants which looked like very tall smooth sumac (Rhus glabra). And yet . . . I was not so sure it was smooth sumac because I didn’t see the distinctive upright berry clusters. After stopping and taking photos of this unknown (to me) plant, I was able to identify it as Tree-of-Heaven (Ailanthus altissima). Interestingly, Tree-of-Heaven has another common name — Chinese sumac — which shows how similar these plants look, without closer inspection. Now, as I’m driving and checking out plants along the road, I still wonder exactly which plant I am seeing. What’s confusing is that both plants have alternate compound leaves with the same drooping habit. And both plants grow in open “waste” spaces along roads, etc. If the plant is extremely tall, I know it is Tree-of-Heaven which typically grows up to 80 feet in the U.S. 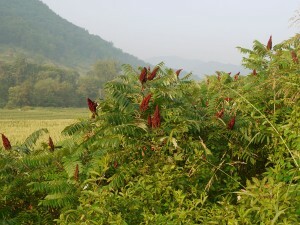 In contrast, the smooth sumac grows to a maximum height of 15 feet. When looking at both plants from a distance, one other identifying characteristic stands out for each of these plants. The smooth sumac has the upright cluster of tiny red berries which persist (in a darker red to black coloration) through winter. 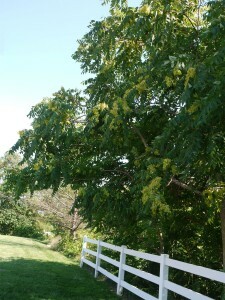 Tree-of-Heaven has clusters of flat, twisted, winged seeds which are yellow / light green / rosy in color. These fruits also persist on the tree through winter. If I really want to be sure of which plant I have before me — especially if it is a smaller specimen or if it might be a male Tree-of-Heaven (which does not have fruit), then I look closely at the leaves. 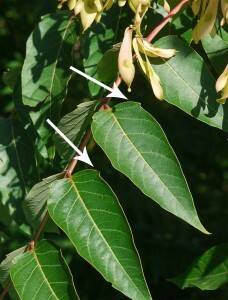 Both plants have compound leaves alternating on their twigs or branches. 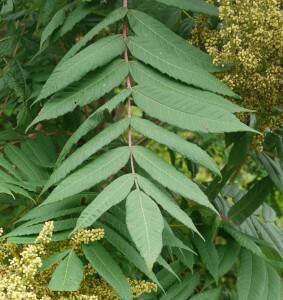 Tree-of-Heaven has an even number of leaflets on each leaf while smooth sumac has a single leaflet at the end of the leaf. The leaflets are distinctive. Smooth sumac leaflets are serrated along the entire margin. 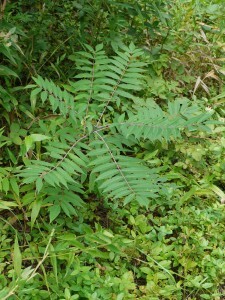 Tree-of-Heaven leaflets have one or two “glandular teeth” at the base of the leaf. If I were brave enough to want to smell some strong acrid stuff, then I would rub the stems or leaflets. 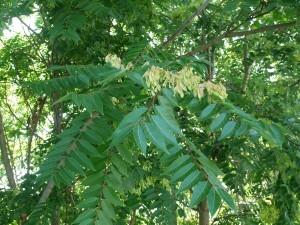 Tree-of-Heaven is notorious for the horrible smell associated with its leaflets and flowers. There are a few other finer points which could be presented for distinguishing smooth sumac and Tree-of-Heaven. However, the easiest features to focus on include the leaflet shape, the overall number (even or odd) of leaflets on a leaf, the smell of the leaves, and the mature height of the plant. 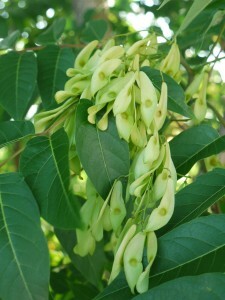 For more information about identifying characteristics of Tree-of-Heaven (Ailanthus altissima), visit here. 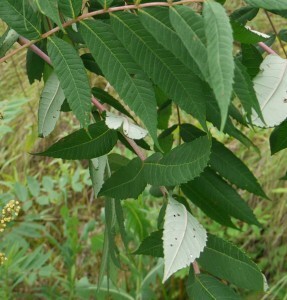 For more information about identifying characteristics of smooth sumac (Rhus glabra), visit here. This entry was posted in Plant comparisons, Plant id story. Bookmark the permalink. Thank you for this clear and concise comparison!